The Fort Collins AC professionals at Ace Hi know a thing or two about pre-summer AC maintenance because, well, we’re super passionate about it. When summer comes around, you shouldn’t feel like you’re getting broiled like a rum-glazed ham in your own home—you should feel like you’re getting chilled like a crispy can of suds, even when it’s 98 degrees outside. That’s why Ace Hi works hard to make sure your unit is pushing out the most delightfully chilled air as humanly possible, as efficiently as possible. Unfortunately, our work begins and ends with your AC unit. It’s up to you to ensure that your icy air makes it into every nook, cranny, and crevice in your home. In this blog, the friendly team at Ace Hi will give you tips on the best ways to circulate cool air (or any type of air) throughout your home for maximum energy efficiency and comfort. Clean your vents and filters. Replacing your filters and cleaning your vents is highly important to the overall performance of your AC system. If you’re in need of an instant improvement to the circulation of cool air in your home, then this is the best place to start. Clogged filters and dirty ducts can prevent cool air from moving quickly and efficiently from your system, but the health effects are worse: these filters and ducts can be full of dirt, dust, pollen, dead skin, and other allergens that can cause sinus and respiratory issues. Plus, they can coat your furniture in a layer of dust, which is incredibly frustrating for the neat freaks among us. Change your filters at least three to five times per year, or even more frequently if you live in an unusually dusty place (we’re talking to you, Fort Collins and Loveland). Keep your ducts clean by shutting them off and removing dust and debris with a Shop-Vac, and do it regularly to keep clean air moving. However, if you’re prone to allergy flare-ups, don’t pull out the dust masks and the Benadryl—call the professionals to take care of duct cleaning for you. Sometimes, even with a clean and capable AC unit, the far corners of your home can be left without cool, refreshing air. To cool down these areas, it’s time to get your fans moving. Use table and floor fans near your AC unit to push cool air forward and into your bedrooms and other areas of your home. Keep your windows closed during this process—you don’t want all that cool air escaping after you’ve moved it across your home. If you’re fortunate enough to have ceiling fans in your home, bring these into the mix as well. 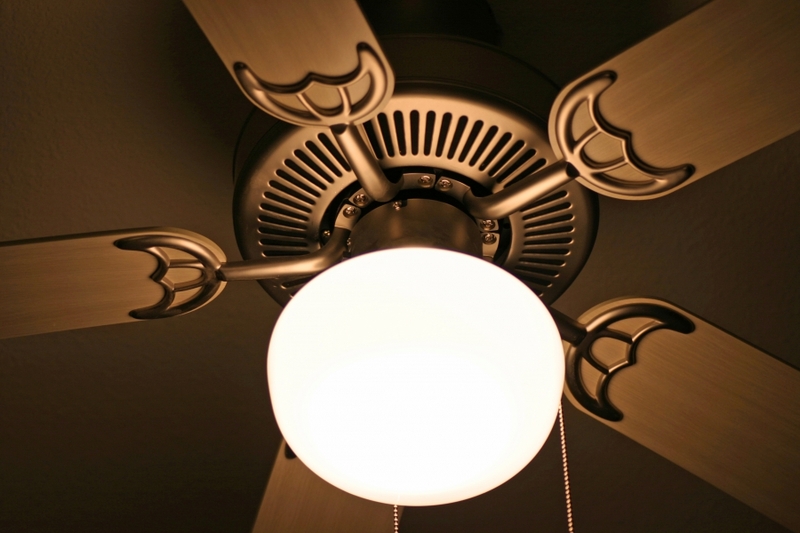 Use the counterclockwise setting on your ceiling fans to push hot air up and cool air down in order to accelerate the cooling effect in your home. You’ll lower your home’s temperature rapidly, and you’ll enjoy a cool, invigorating breeze as you walk around every corner. Now that’s how to be cool. Have an attic exhaust fan installed. Proper circulation isn’t just about moving cool air around your home—it’s about getting warm and hot air out as well. When cool air circulates through your home, warm air rises—and more often than not, that air gets trapped way up in your attic. This warm air, accompanied by moisture, can cause mold buildup, strange smells, and deterioration of your attic floor (or as you might call it, your ceiling). To keep your home cool and to avoid any structural damage, have an attic exhaust fan installed. Instead of pushing air forward and into your home, these fans pull air out—ensuring your attic is cool, dry, and mold-free. Even when your ducts are clean, they could be preventing your home from being as cool as it could be; all it takes is a tiny crack or hole in your duct system. Even the smallest of holes can decrease the efficiency of your system dramatically, so it’s important to have your ducts check periodically for signs of punctures, slits, or open seams. These seams are much harder to find than a hole in a river raft or an inner tube, so save your MacGyver skills for the next home improvement project, and call in the AC professionals to patch things up. Call your Fort Collins AC team! If you’re unsure how effectively you’re circulating air in your home, or are curious about whether or not your AC system is working efficiently, Ace Hi is happy to help! Our experienced AC professionals can inspect and diagnose problems with your AC system, and give you tips to keep your home cool and comfortable all summer long. Schedule an appointment with us today!